Getting into serious debt is easier than you think. You miss a couple of payments for loans, and then you are soon finding yourself struggling to pay as the interest is too high. These are some other warning signs that you are spiraling into debt and tips to stop it from happening! One warning sign that you are spiraling into debt is you are taking out payday loans. You may find you need to pay out for something, and don’t have the funds to do it. Therefore, you look for a quick solution to be able to afford to pay out the money. However, if you start taking out payday loans, you could soon start spiraling into debt. These are meant to be short-term solutions that you have to pay back quickly. If you don’t pay it back quickly, you will find high-interest rates that will end up seeing you pay back twice the amount you needed in the first place. To stop you spiraling into debt, you should avoid taking out any payday loans. You should look for a loan which will allow you to pay monthly installments so that it’s much easier to pay back on the long-term. Another warning sign that you are spiraling into debt is if you can’t keep up with your mortgage repayments. It’s so important that you pay the repayment every month towards your mortgage. If you miss a couple of payments, you could be at risk of foreclosure. You should talk to your bank about having a mortgage holiday to help you get back on the straight and narrow. If you still can’t afford to pay your mortgage, and can’t see this situation changing anytime soon, you could consider selling up. You could look for a buyer for your home, or you could find a company who will provide cash for house. That way, you can quickly pay back your mortgage provider, and then can easily get yourself out of debt. An additional warning sign that you are spiraling into debt is if you don’t know how much money you have in your bank. It’s a bad sign that you aren’t keeping on top of your finances, and spending without knowing how much is in there. You need to ensure you are checking your bank account on a regular basis and checking your monthly statements. As this article explains, it will help you to see where your money is going and how to control it better. 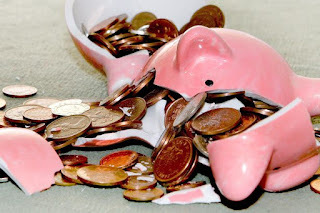 Another warning sign that you are spiraling into debt is if you are using your savings account. You need to make sure you don’t touch this account if you want to stay out of debt. Soon as you start spending your savings, you are opening yourself to debt as you have no safety barrier. You need a savings account so you can accumulate money for your future. So that you don’t spend your savings, you could invest it instead. Try and stay away from credit cards, so you don’t have a chance of getting into debt.